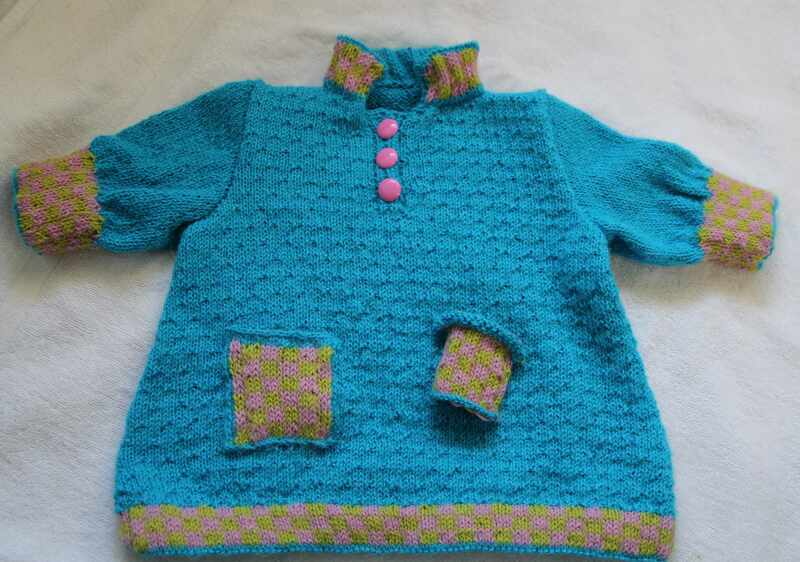 When placing buttons and buttonholes, some knitters make the mistake of measuring each placement. The tape measure is of little help in getting accurate placement because knitted fabric stretches and what is 2″ (5) cm one time may not be the same measurement the second time. The trick to placing buttons and buttonholes precisely is counting rows. Know how many rows you get per inch and you can place buttons and their corresponding buttonholes right where you want them. According to pattern standards the first and last button is usually place 1/2 inch (about 1.25) cm from the top and bottom of the garment. The rest of the buttons are spaced evenly between these two. I do a dry run, laying out the buttons on the back of the garment because the front area where they will go has not yet been constructed. When placing the top and bottom button I figure out how many rows I am working per inch. For the latest baby sweater I am knitting 9 rows per inch. To find how many rows per 1/2 inch I divide 9 by 2 which equals 4.5 rows. I have a choice of rounding that number up or down. I decided to round it down to 4. Thus, I know 4 rows from the top of the garment and 4 rows up from the bottom of the garment will have buttons. Next, I lay out the remainder of the buttons between the top and bottom. For this particular baby sweater I only had one more to place. I found the middle distance between the top and bottom by measuring between the two buttons. The total distance was 2.5 inches. To find the half way point, I divided the total by 2 and got 1.25 inches. I multiply the 1.25 inches by my row gauge of 9 and I get 11.25 rows as the middle distance between the top and bottom button. Again, I round down to 11 rows. Now I know that at four rows I need a buttonhole and button. I knit another 10 rows and on the 11th I make another buttonhole. When I am four rows shy of the top of the garment in goes another buttonhole. Since buttonhole bands and button bands are usually worked separately the row counting works great. On the buttonband when I come to a row where a button will go I mark that row with either a piece of yarn or a removable stitch marker. When it comes to sewing on the buttons opposite the buttonholes I don’t need to fuss or fiddle around because their placement is already marked. I hope this information helps make placing buttons and buttonholes a little easier. What is an in-depth schematic? It contains much more information than a schematic that comes with a pattern. It accounts for every stitch, row, inch, centimeter, rate and amount of increase or decrease that goes into making the garment. A well-made in-depth schematic tells the designer everything he / she needs to know in order to create the garment and does it through numbers, not words. Ultra in-depth schematics even cite the types of seaming stitches used. Here’s an example of an incomplete one I began creating only to abandon it once I decided to measure gauge in the pattern stitch rather than stockinette. I use inches when I design. They are highlighted in yellow. Stitch counts are highlighted in pink, row counts in orange. Since I’m in the numbers stage of designing I translate the inches into centimeters. This makes it easier when and if I decide to write up the pattern. 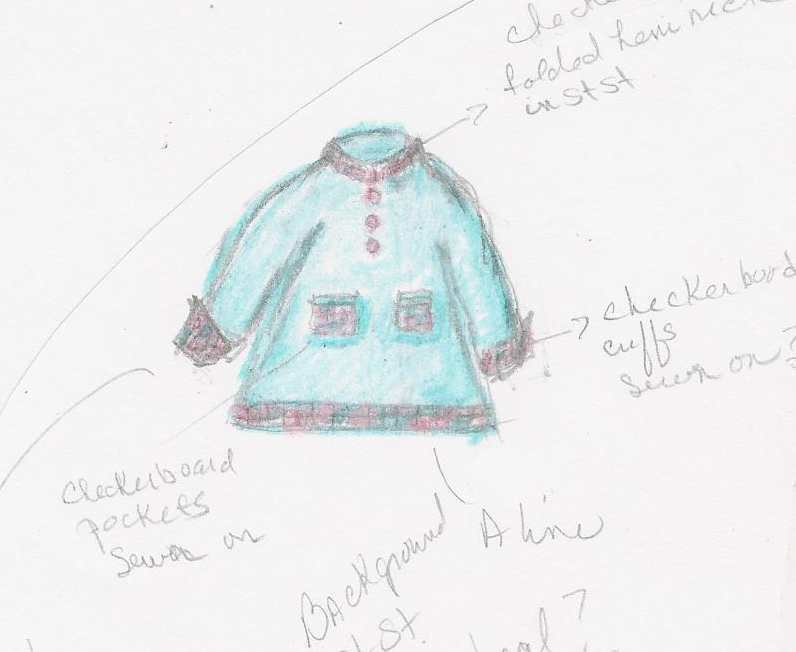 Missing from this particular schematic is the rate and amount of decreases for the neckline and armhole shaping. Also missing is the stitch pattern information for the body, which includes the stitch multiple plus the number of extra stitches needed to make the stitch pattern and the number of rows needed to complete one pattern. Why include the stitch multiple on a schematic? It tells me the number of stitches in a set to complete one pattern. A stitch multiple of 4 plus 2 lets me know that I will have less of a headache if I make all my stitch count numbers multiples of 4. A multiple of 4 is simply a number that when divided by four provides what I call a “clean” answer, or a whole number with nothing left over. An example of a multiple of 4 is 12. When 12 is divided by 4 it equals 3. No messy left overs in the form of fractions or decimal points. So what does the plus 2 mean and where does it come in? Plus two tells me that at the beginning and at the end of the 4 stitches I need to have one additional stitch. For example, if I had a row of 26 sts the first stitch would be one of the plus 2, then I could work 6 sets of 4 sts across the row leaving the very last stitch to count for the second stitch of the plus 2. In reality, I would add a selvedge st to either end for a row count of 28. Stitch multiples also give me an inkling of how the pattern will look when I start increasing and decreasing. Sometimes where and how often an increase or decrease is performed is affected by the stitch multiple. 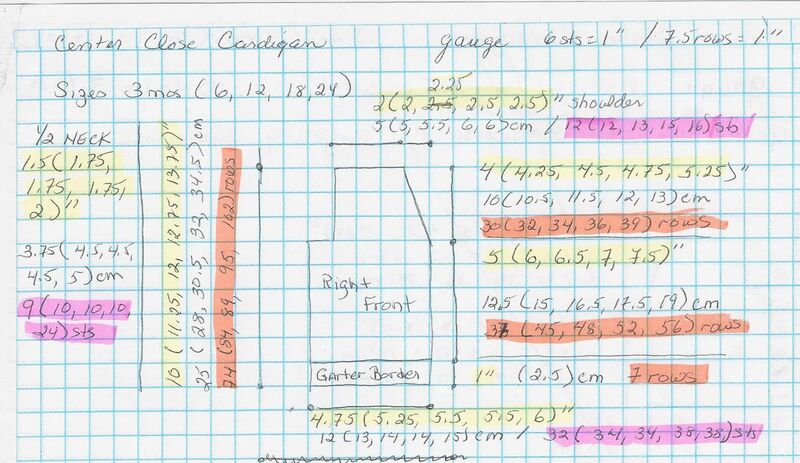 I try to work out all the math before I start knitting the garment and include it on my schematic. Doing so prevents nasty little surprises from popping up when I am half way through a project. Well…most of the time it does. 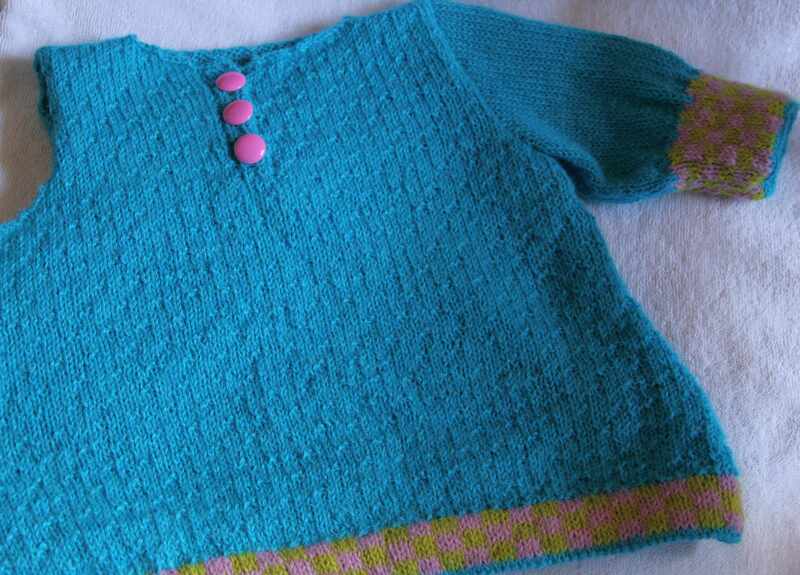 Progress continues on the 1960s girl’s sweater. Last night I crocheted the sleeve to the sweater. That’s right, I didn’t sew it, I crocheted it. I love the perfect way sleeve meets sweater when it’s crocheted together. When I first read about crocheting knitting seams together, I was a little skeptical about how it would turn out. After all, I had sweated, cried, and suffered numerous meltdowns learning what sewing technique to use where and perfecting those sewing stitches. Wasn’t all that a rite of passage into the knitting world? Along comes Jean Frost and her book Custom Fit Knit Jackets Casual to Couture and there’s a whole new way of looking at seaming. Crocheting seams together gives a neat, but thicker seam than sewing. While it’s great for finger weight yarn and may work with a DK weight yarn, I don’t think worsted or Aran weight yarns would work. While I loved the way it brought sleeve and armhole together, I found I prefer to sew the side seams of the body instead. This in part is due to the way I start my seam work. Although I am comfortable with a crochet hook in my hand, I found it slightly awkward seaming with it. First, selvedge stitches make crochet seaming easier. While I had none on the cap of the sleeve, this didn’t cause a problem. Probably that’s because the cap was intentionally shaped to fit this particular armhole shape. What did make things awkward was how and where I like to start my seaming. I like to start my seaming in medias res, so to speak. Translated that means “in the middle of things.” No matter what seam it is, I start my seaming from the middle out so I don’t worry about weakness at the end of seams. This way of seaming was a little awkward with a crochet hook. When I turned the piece to continue seaming the other half, the yarn was on the wrong side of the hook. So I had to work an extra step to get the yarn into the correct position. Another plus for crocheting knitting seams together is at the end of the seam there is no worry about securing the yarn so the seam doesn’t come undone. When I came to the end, I just finished off the crochet stitch. It was like locking the seam shut. I had less worry about weaving in the ends so the seam wouldn’t open and could concentrate instead on intertwining the yarn in such a way that it could not easily be seen. Crocheting knitting seams together takes a little longer than sewing them, but overall I am happy with the results.